We have just fitted a two bar sprayhood and stackpack system to "Bitter Lemon", an Ericson 35. 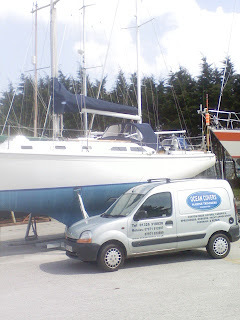 After two years at Falmouth Marine College, Paul, with a Diploma in Boat Technology, and an engineering qualification, joined a local sailmaker and very quickly developed a boat cover department within the business. After three years, he joined another local company and this time stayed fourteen years! In November 2004 we decided to go it alone and Ocean Covers was formed. Since this time, we have worked in local marinas and boatyards, on Ministry of Defence vessels in Port Pendennis Shipyard, and on every type of vessel from RIB to luxury motor yacht. Gill ? Well I have been bookkeeping and office managing for over twenty years, so this has proved very useful in the running of the business, keeping the paperwork in order, and making sure the bills are paid! Welcome to the Ocean Covers Blog! We can use your existing bars, make alterations to them, or design and fit new bars. All sprayhoods made to suit your requirements and to enhance your boat. Other businesses we recommend because of the quality of their work!